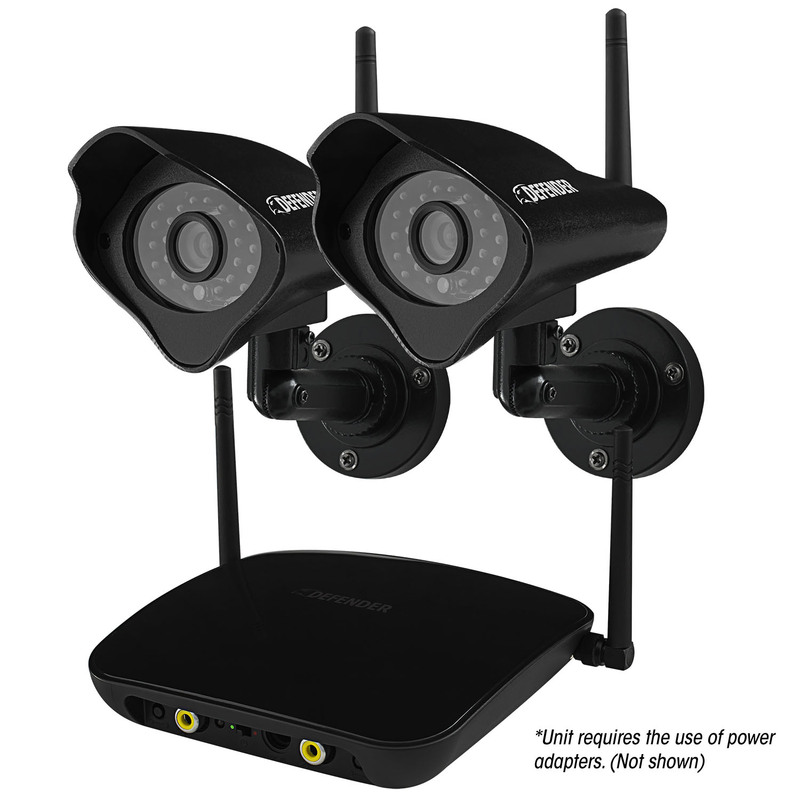 Defender® PHOENIX™ Wireless Security System can be used to monitor video in any indoor or outdoor space at any time of the day. This wireless plug and play system allows for easy set up in a matter of minutes to a TV or a DVR. The wireless, weather resistant cameras included with this system have 24 infrared LEDs that allow you to see up to 75ft in the dark. Ideal for monitoring what matters most. ClearVu digital wireless technology makes set-up hassle free. This advanced system automatically connects when turned on – no wiring required. Superior digital functionality ensures that the signals remain strong as you monitor your business or home wirelessly, up to 450ft away. See it all in pristine detail, day or night: 520 TVL cameras with 75ft night vision leave nothing to the imagination. The indoor/outdoor camera provides you with a clear, secure picture, even when you monitor after-hours in a dark location. The camera comes equipped with advanced night vision and 24 infrared (IR) LEDs that let you see clearly in the dark, up to 75ft away! The LEDs activates automatically when it gets dark. I bought this 4 pack of the Pro 800 TVL wide angle cameras (21146) to add to my current system with the PRO 16ch DVR 1TB HDD (11103) with 8 PRO 600 TVL standard angle cameras. I was concerned that I would not get any benefit from using the wide angle cameras with the regular DVR so the first thing I did when I received the new cameras was to do a side by side comparison with one of my standard angle cameras. I found that the field of view on the new camera was considerably wider and taller so I am very please with the results and performance of the cameras with my system. The night vision performance is great also. I am now waiting for the new 800 TVL wide angle dome cameras to become available so I can complete my system. Nice Camera/SEAMS TO BE WELL BUILT!!!! I bought one camera about 2 months ago and bought another one for the other side of the house. Works good for night vision and has a good picture. ALSO FOR PEACE OF MIND!! !